So Why Is AshleyMadison Featuring Hillary Clinton in a Billboard, Anyway? Should we expect better of AshleyMadison.com? Definitely not. But while this isn't the first time the adultery website has used a politician's past to promote its ideals (heck, it's not even the first time they've used someone in the Clinton family) this billboard is particularly questionable. 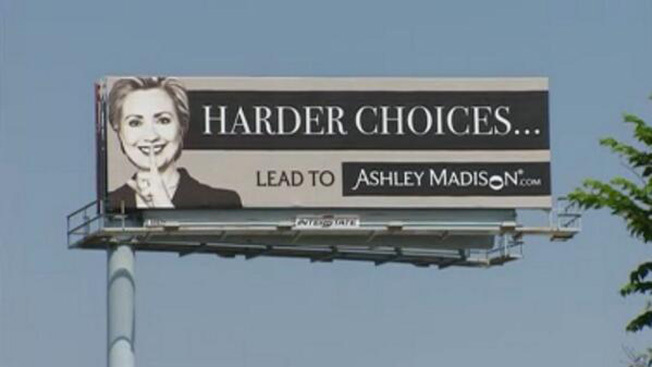 The tagline for it doesn’t even really make sense: "Harder Choices … lead to AshleyMadison.com." Oh hey, they're playing off her book title. Cheeky, but what are they trying to say? Hillary Clinton hasn’t cheated on Bill, as far as we know, which puts her in quite a different situation than most of the politicians featured in the site's ads. So what choice are they referring to? In an interview with MyFoxChicago, site CEO Noel Biderman danced around the answer, saying that it's less about Hillary than about how the decision to have an affair is "not an easy choice. People, women in particular, don't come to affairs lightly. They try to explore alternatives within their relationship. They try everything. For many, it's a last-ditch effort before, maybe, separation." But he also acknowledged that Hillary was being featured because she's a "survivor of infidelity." Is that supposed to be flattering? Hillary Clinton is a lot more than an adultery survivor, and to continue pulling from the the same '90s scandal is worse than offensive; it's boring.